Prepare customizable menus and fix up the family's dream house. "This game was an absolute blast to play and I really enjoyed it. Super fun and lots of different scenes. I love all the Delicious Emily games but this one has to be my absolute favorite. Highly addictive, super fun and a great storyline!" 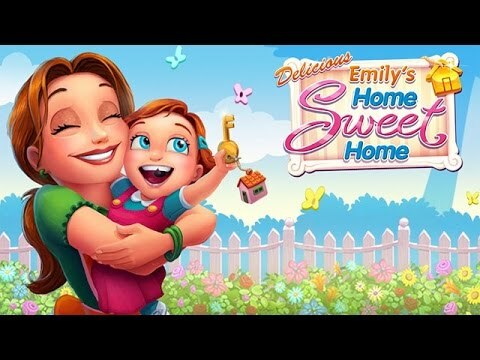 Discover Delicious: Emily's Home Sweet Home and help the O'Malleys fix up their dream house. After a warm welcome, some neighbors reveal a different nature. A turbulent time follows in which Emily and Patrick must go above and beyond to stop their house from being condemned. Prepare new customizable menus, enjoy extra daily challenges, and decorate by unlocking every achievement. Help your favorite family fix up their dream house before it's too late. I really enjoy playing all of the games containing Emily and her sister. I just wish that I had the money to buy all of them. I just love playing the series and can easily recommend this one. It kept my interest and time just flew by. I love the Delicious Emily games. They are so much fun to play. I love the game and just cant stop playing. It is also available at a very good price. It keeps you hoping and is very addictive. Another great game from the Delicious series. Keep them coming please. I just love playing this game and I hope they make more. I really enjoyed the game. It keeps your mind going. I would suggest this game for others to play. I really like playing these type of games. I always enjoy cooking games and this one provides great challenge.